Atari 2600 Pac-Man | Grantster.com - The WORST In Computer History - Returns! A. Assemble an entire team of programmers to create an Atari 2600-based version of Pac-Man as close to the Arcade version as possible. Knowing that this game would create extra revenue, the money would be well invested. B. Knowing the limitations of the 2600, you would gather expertise on the system from every qualified programmer to overcome this. C. Knowing the time constraints, and the limited programming staff, you announce a realistic release date for a quality program. You know that you will miss the Christmas season, but you also know that the company could suffer a public relations nightmare if you released crap. D. Lock a so-so programmer in an office for a short period of time and tell him to develop the game, pronto. People will play Pac-Man solely because it is Pac-Man, not because it’s fun to play. If you chose D, you should send a resume to Atari immediately. You would’ve had a bright future there, had they not gone bankrupt. Where do I begin? There are so many mistakes, oversights, and deliberate changes, I don’t think that I could remember them all. First of all, the background is blue! I mean, BLUE! Come on! I’m sure the Atari can even put black on the screen. Look at the score! It’s black! Why could you not even do this one simple thing?!? Instead of having a nice looking maze, with curved walls outlined in blue, you have these square looking clumps that are solidly filled with a color resembling fresh puke. There is no such things as dots anymore. Now they are known as wafers. The “ghost box”, where the ghosts get re-energized after being eaten, is transformed from a rectangular object, with a distinct “door”, to an ordinary square box. Even worse than that, the ghosts do not exit through the top of this box! They go out the right-hand side! And how about the tunnels? The arcade version has them on the right and left hand sides of the screen. Not the good ol’ Atari version. They decided that the top and bottom was a better place to put those. I used to wonder if the developer ever bothered to chunk 25 cents into the arcade and actually see how the game works and what it looked like!! Now you might say, “Yeah the graphics were pretty bad, but most Atari 2600 games had bad graphics too.” I’ll agree with you. But I would wager to say that most of the Atari games, that were based off of arcade games, were as fun or more fun to play than there arcade counterparts. Atari could usually find some way to make the game even better. Not with Pac-Man. The ghosts on the arcade could think a little. They turned around and went the other direction after eating you ate an energizer. 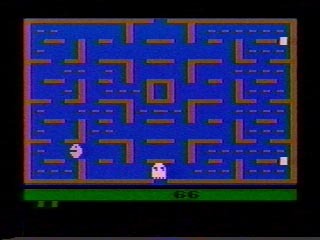 The ghosts on the Atari version would move aimlessly in the beginnings of the game. As the game progressed, they were fast, and all they did was go straight for you. At that point, you don’t even know that you have more than one ghost, because they all sit on top of each other while coming to attack you. They aren’t even different colors. They are all the same color as Pac-Man. Better yet, there is no ghost on the arcade version that is this color. When Pac-Man eats an energizer (now dubbed “Power Pellets” by Atari), the most annoying sound ever comes over your television speaker. There is no explanation without hearing it. The ghosts continue to look and maneuver the same as they did prior to your eating the power pellet. If you get about three inches from the TV screen you may be able to see that their color changed from a very light yellow to a very light blue. Well, you’ve always got the annoying noise to tell you whether or not you can eat a ghost. After a ghost is eaten, his square eyeballs make their way (slowly) to the ghost box. They wait until your power pellet wears off, and then materialize back into a ghost. Whereas, the arcade version has them immediately turn back into a ghost, and exit (I guess the ghost is now immune to Pac-Man’s energizer). The Atari version is so lame that you earn a “free life” every time you clear a screen. Like that is some kind of victory…clearing the screen on the Atari version. I think I did that one time with the television set turned off. You actually have to earn your free lives on the arcade version. I think it is every 10000 points. I could continue to point out the differences between the arcade version and the farce version, but I have damaged my fingers already from typing too much. In a nutshell, Atari, you blew it. Of course, financially, they won. Atari generated millions in revenue from this game. Unfortunately, it also generated less confidence in the consumer who chooses to spend hard earned money on things like this. Years later, Atari would get a serious wakeup call when they made the “ET” game. They paid (reportedly) over 21 million dollars just for the license for the game. After extremely weak sales, they dumped thousands and thousands of cartridges in some landfill in New Mexico. Someday, I may just have to add Atari to the Hall of Shame. But today, Atari 2600 Pac-Man will always top the list.